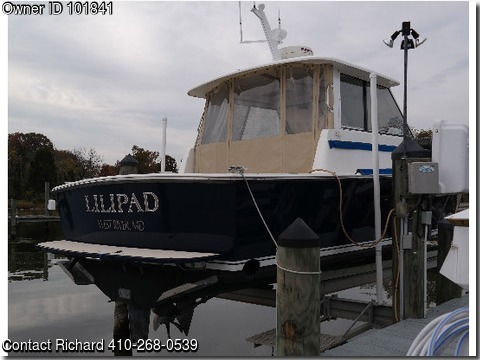 Boat is located in Annapolis,Maryland.Please contact the owner @ 410-268-0539...2002 HUNT YACHTS Surfhunter 33, Classic Down East style, hardtop express cruiser. Ray Hunt designed Deep-V hull with substantial bow flair, "dry boat". 57 degrees dead rise, 21.5 stern dead rise with three running/lifting strakes that give her great running lift, exceptional directional stability when running in turbulent sea conditions. Single engine Cummings inboard tubo diesel, 370hp. Impressive efficiency performance: 7.2 knots @ 5.14nm/gal, 13.7 knots @ 2.8nm/gal, 19.1 knots @ 2.36nm/gal, max speed 27.8 knots. Range at 19 knots with 165 gal tank is 390 nautical miles. Boat spent two years in warehouse, one year on the hard, nine years on a lift out of the water. Beam 11.08', displacement 12,000lbs. fuel tank: 165gal, water tank: 30gal, holding tank: 12gal. Overview: Perfect for cruising couple or as a family weekender. One cabin v berth and dinning table berth, sleeps 3-4. Dinning table has storage under seats, hanging locker, galley with refrigerator, butane stove, microwave new 2007, hot and cold water, stainless sink, drawer, cabinets. Enclosed head w flush toilet, stainless sink, hot and cold water shower. Two solar powered electric fan vents, cabin lighting, 110 volt air conditioning new 2007. Pilot house: port side bench seat with storage under bench, removable teak folding table, Fan at captains chair, Stidd captains chair, lower panel vents on windshield, overhead hatch vents. Raymarine electronics: GPS, depth sounder, autopilot, radar, 10.3" color plotter, VHF radio, compass, fish finder, trim tabs, joystick bow thruster, two automatic/manual bilge pumps, trolling valve controller, windshield wipers, windshield washer, remote controlled search light pin pad controller, anchor windless control. Pilot house sole is hinged at front and the aft raises with electric jack screws to provide clear unobstructed access to engine compartment. Engine regularly maintained, bilges and engine are very clean. Cockpit: stern bench seating with two storage boxes under seats. Cockpit freshwater shower, two rod holders, davits for dinghy, swim platform with ladder, steps up to exterior side walkways. Exterior fore deck: Raised cabin with two portholes per side, varnished teak toe rail and port hole eyebrow trim, stainless steel railings on cabin roof and pilothouse roof, stainless safety railings, stainless anchor roller, galvanized plow anchor, twenty feet of anchor chain, hatch for raw water wash down and anchor chain and rope storage, electric anchor windless controls. Complete navigation lights and Coast Guard required equipment. 30 amp 110 volt shore power, battery charger, high amp alternator. Mast head with radar antenna, horn, search light, VHF antenna, navigation light. Everything works, and in shipshape condition. New awl-grip hull paint with clear coat 2013. Interior looks new, never smoked in. Cell 443-343-8318 call/text, home 410-268-0539 no text capability.